Anchorage's Dimond High football team will officially return to action Friday, a move that will satisfy eligibility requirements in time for the Lynx to play a game on Saturday, Sept. 8. The team has been suspended since Aug. 22, when Anchorage School District superintendent Deena Bishop called off all team activities after learning of "allegations of misconduct" during the team's trip to Fairbanks for an Aug. 18 game against Lathrop High School. Meanwhile, the Anchorage Police Department investigation into the incident is continuing. Both police and the district have declined to provide further details about what reportedly happened during the football team's trip. In an earlier interview, Bishop called it a "serious allegation." In an email sent to football parents Thursday night, Dimond principal Tina Johnson-Harris asked parents and players to attend a 5:30 p.m. meeting at the school on Friday. Bishop will be there to update parents and players on the program's status. "After a brief introduction, players will be released to participate in a supervised 1-hour conditioning workout," Johnson-Harris wrote in the email. "The purpose of this 1-hour practice is to allow football players to maintain their ASAA eligibility to compete in games if the program continues." Players will have limited interaction during the workout, Johnson-Harris wrote. They will not wear pads or helmets "so they do not need access to the locker room," and Dimond High "will ensure adequate supervision is provided." Players were told not to bring cell phones or other electronic devices to practice and to "maintain a positive, respectful atmosphere." Dimond has forfeited two straight games, and without at least one school-sanctioned practice this week it would have to forfeit a third straight game. If Bishop lifts the suspension, Friday's practice will ensure that Dimond players are eligible to play the team's scheduled Cook Inlet Conference opener against East on Sept. 8. The two games Dimond forfeited were nonconference games that don't impact the team's postseason hopes. Alaska School Activities Association statewide eligibility rules say that if a player misses two straight weeks of practice, they must attend five practices before regaining their eligibility. "By practicing this week the students wouldn't have missed two weeks of practice," ASAA executive director Billy Strickland said. "If they get a practice this week, they wouldn't have to have five practices to reset their eligibility." After the one-hour workout Friday, players will attend a presentation by Louis Wilson, an East High graduate and assistant basketball coach at Grand Canyon University in Arizona. "He will discuss teamwork, how we should treat each other, and how to handle future criticism on and off the field," Johnson-Harris wrote. "He will also review the athletic code of conduct and help set expectations moving forward." MJ Thim, police spokesman, said on Friday he had no new details to release in the ongoing police investigation. 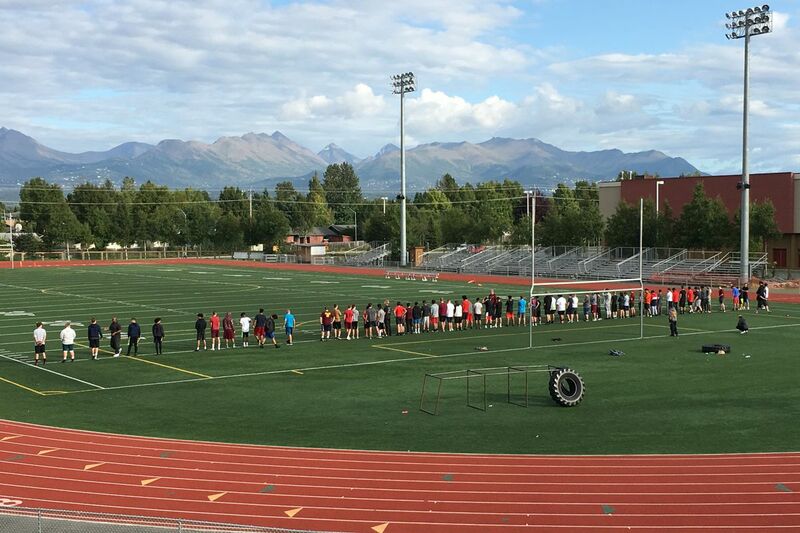 Before Friday, Dimond High football players had been spotted on the school fields. The district said in an online post Wednesday that those workouts were not organized or sanctioned by the district.